"Lord, Tell Me What To Do"
Discernment can be described as a process of spiritual exploration - a time in which a man or woman acknowledges God's call to serve Him in a particular vocation. If you are inspired by St. Francis and his example, then you may have a vocation to the Capuchin Franciscans. A person who is interested in becoming a Capuchin Franciscan remains in contact with the Vocation Director. The Director helps him discern his call through visits to our fraternities, conferences and “Come and See” Weekends. This period of discernment can be as long as needed. If a person decides he does want to join, he begins the application process. If he is accepted, he then moves into the Postulancy. 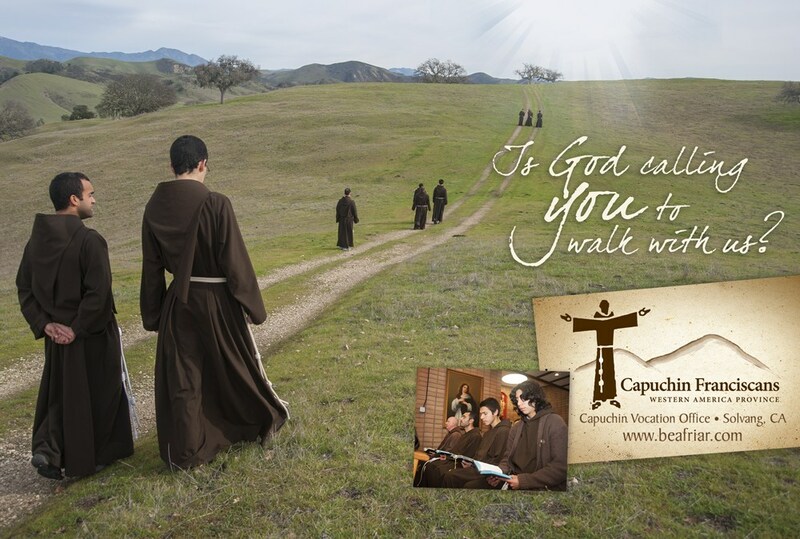 Come and experience contemplative prayer with Capuchin brothers and priests, reflect on the life of St. Francis, and witness the sharing of vocation stories at our retreat house, San Lorenzo Prayer Center, in the Santa Ynez Valley. Vocation Director, Fr. Peter Banks OFM Cap. to follow you in living the Gospel life. by the power of his example. and to all religious orders. Inspire young men and women to devote their lives in your service. Patroness of the Capuchin Franciscans Western America Province.